You can also follow us on twitter @SPERIshefuni using #SturgeonSPERI. 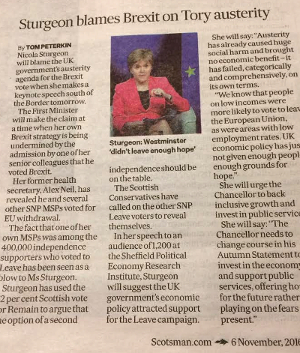 The Herald in Scotland and The Scotsman, amongst other newspapers, have advance coverage of Nicola Sturgeon’s SPERI lecture this evening. The reports say that Nicola Sturgeon will stress how austerity has caused huge social harm, brought no economic benefit and also partly explains why people voted for Brexit.